Home » Telugu » Shilpa Shetty or Upasana Kamineni- Who ravished better in frill sari? Shilpa Shetty or Upasana Kamineni- Who ravished better in frill sari? 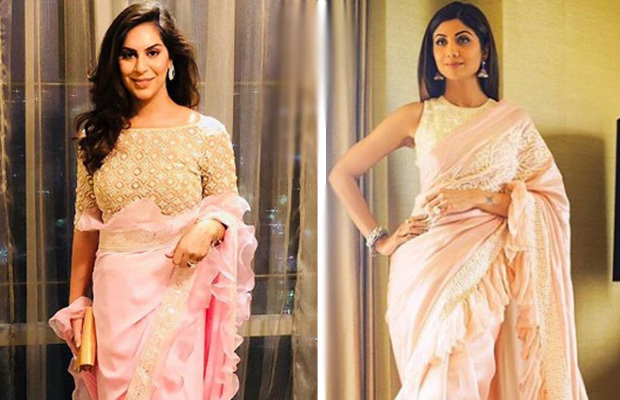 Recently, Bollywood actress Shilpa Shetty and Tollywood actor Ram Charan’s wife Upasana were donning a similar kind of frill sari by two different designers. Retro has suddenly become a buzzword and timeless classics are being brought back with a bang by the fashion designers. Off late, actresses are clicked wearing outfits that bring a true blue retro feel. Frills, boat-neck blouses, collars and puffs are great add-ons to simple, classic and ethnic looks. Something that is currently very much on trend are frilled detailing sari. The frilled sarees look extremely graceful and also gives a modern twist. Recently, Bollywood actress Shilpa Shetty and Tollywood actor Ram Charan’s wife Upasana were donning a similar kind of frill sari by two different designers. At her cousin Anindith Reddy’s engagement, Ram Charan’s wife Upasana made an effortless style statement in a pink ruffle saree paired with embellished boat neck blouse by Abu Jani Sandeep Khosla. She completed her retro look with diamond studs, a gold clutch and wavy hairdo! Well, Bollywood actress Shilpa Shetty was also spotted wearing a similar kind of sari at the recently held Ficci Flo event in New Delhi. Wearing a pink Jayanti Reddy saree with ruffle detailing, Shilpa Shetty accessorised her traditional look with earrings from Tanzila Rab Designs and a cuff from Minerali. Subtle make-up and straight hair rounded out her look. She looks stunning! We are in love with both looks and more importantly, they are carrying it so effortlessly that makes the sari look more stunning. While Shilpa chose to go with a sleeveless blouse, the star wife Upasana styled her pink frilled detailing sari with embellished full sleeves blouse. So next time, if you want to make a lasting impression in a sari, the all-time favourite frilled sarees are the way to go! Which is your favourite look? Comment in the space below! I am starting to like upasana after following her posts on social sites. She comes across as a really down to earth and warm person. No comparison, Shilpa can slay in any look or costumes. But, I really liked Upasana here. Her hair and blouse made her look better. Upasana doesn’t own a photogenic face but she really looks good and lively in videos.